Combinent has recently added a new slip ring category to the slip rings product portfolio. These new slip rings are called Small compact slip rings. These slip rings are small units which have very good price vs quality ratio. These slip rings are used e.g. in video systems, robotics, cable reels, medical equipment and packaging machines. Compact slip ring category has good selection of standard slip rings but in addition those can be also easily modified to have e.g. more channels or higher IP classification! Some of these slip ring types are used also in military applications. Combinent produces also hybrid slip ring units where different slip ring types as high power, signals and rotary fluid joint are all integrated into the same slip ring solution. Compact slip rings are used in many of those solutions to manage the low current signals. Some of these hybrid slip rings used e.g. in cranes are quite big units and may be over two meters of height. 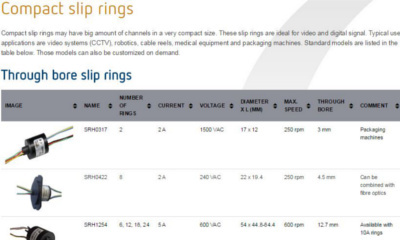 Customized versions of the Compact slip rings may have easily over 100 channels in a very small space. Rating life for those are up to 10^8 revolutions depending on the speed and environmental conditions. Compact slip rings have quick delivery time and those are in compliance with CE and ROHS standards. Please have a look on the Small compact slip rings category, find a suitable slip ring for your needs and ask us a quote or more information.